Handmade Holiday & Seasonal Dog Collars from K9 Bytes, Inc.
A Collar for Every Occasion! 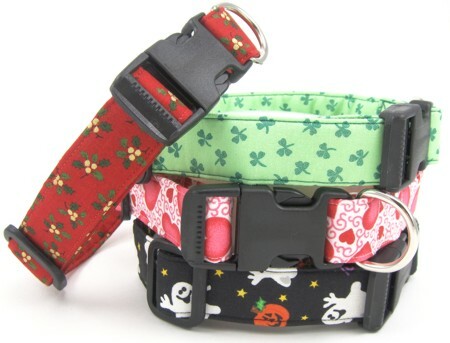 Now you can dress your dog for every season and holiday with our fun and stylish holiday dog collars. We have holiday collars in Birthday, 4th of July/Memorial Day, Christmas, Hanukkah, Thanksgiving & Fall, Halloween, Valentine's Day, Mardi Gras, St. Patrick's Day and Easter themes. Matching Leashes are also available. Our quick-clip dog collars have a quick release buckle (side squeeze buckle) and nickel plated D-ring. Dog collars are handmade in the USA from cotton fabrics. They are lightweight and nylon free. Matching Leashes are also available. Collars are adjustable to fit your dog perfectly. See the size chart to determine the correct size for your dog.